Great Search Website for identifying which type of Implant your patient has | Rotsaert Dental Laboratory Services Inc.
What brand Implant is that? This is an excellent resource for implant dentistry. Have you ever had a patient with an implant and wondered what type of implant it was? This website will help you identify the implant. Whatimplantisthat.com is a free resource to the dental professional. They are in the business of trying to help you identify dental implants by merely looking at your patient’s radiographs. You would be surprised at how many unique characteristics implants have that can differentiate them from the thousands of implants out there. 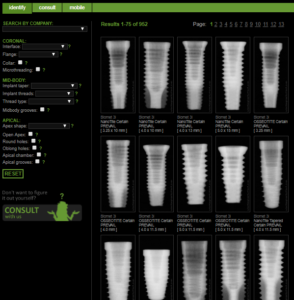 Take a good quality x-ray and search through the images the website offers to identify the implant radiographically.